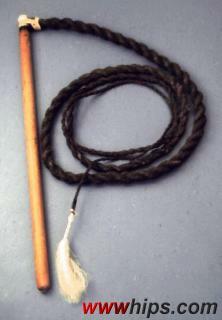 This is a "goasl", a south German whip which is used for traditional sports whipcracking, the so-called "Aperschnalzen". Groups of bachelors crack their whips synchronously, holding them with both hands. The whip is made of tapered, tarred rope with a synthetic cracker. The joint swivels. Note huge size, the handle measures 2.5 ft!